In this follow-up to 2018’s Arrow’s Flight, a tale of an 18th-century sunken ship and a fortune in gold sends Arrow and her crew on a venture that seems harmless enough. That is, until it attracts the attention of the flamboyant owner of the Golden Dragon, a 240-foot sailing machine crewed by cashiered ex-marine Lord Barclay Summers and his band of mercenaries. When Arrow and her crew are viciously attacked, they seek shelter in the treacherous Great Sea Reef where they become ensnared in a life-and-death sailing match against the murderous crew of the Golden Dragon. 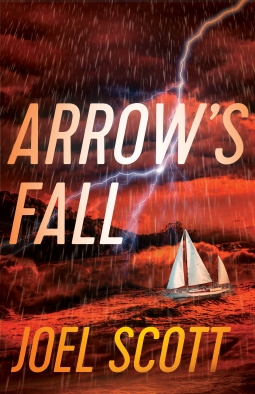 Continuing the same heart-pounding excitement of Arrow’s Flight, Joel Scott weaves together terrific storytelling, breathtaking action, and an in-depth knowledge of sailing. Arrow’s Fall will be a battle of instinct versus science, old versus new, wood and cloth against steel and technology, with destruction and death waiting on a missed tack.